With Lightning Futures, you can buy and sell Bitcoin using margin deposits. The units used are BFT. An open position on the Lightning Futures (Bitcoin Futures) board can be closed before its maturity date by performing a counter-sale by means of net settlement. If the position is not closed by its maturity date, it will automatically be settled using an SQ (special quotation). The SQ is determined by using the spot board price at the maturity date by the Itayose method. One of Lightning Futures’ most attractive points is the ability to leverage up to 15 (*) times your margin deposit to make Bitcoin trades. "Itayose" is a method for setting a price that matches quantitatively by repeatedly performing buy and sell orders according to a prescribed order of priority, and executing a trade with that price as the single consensus price. It is the method used for setting the SQ (settlement price) on a Lightning Futures (Bitcoin futures) trade sheet. Please see the table below for the maturity schedule for Itayose, margin settlements, etc. bitFlyer supports three different types of futures trading. The next quarterly futures will be listed two weeks before the maturity date of the current one. The maturity date is displayed as follows. 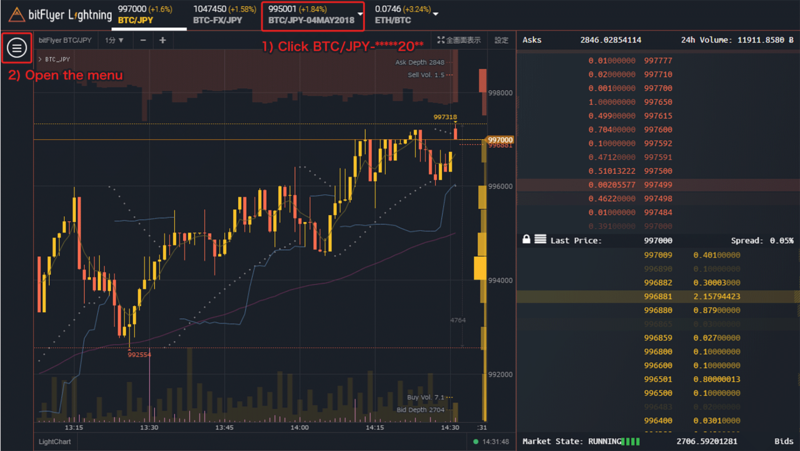 Futures are displayed as "BTC/JPY-*****20**"
For example, "BTC/JPY-11MAY2018" matures on May 11, 2018. As necessary, the results of the execution will be displayed after the net settlement has been completed. The schedule above is an approximation. It may change due to various circumstances. Order of priority is as follows. If you have placed multiple limit orders at the same price, the orders will be executed in the order they were placed. All market orders placed before the single-price auction is determined (including orders placed prior to scheduled maintenance) will be considered to have been placed at the same time. There are opportunities for profit in both bear and bull markets with Lightning Futures. Trade Bitcoin with up to 15x the value of your margin deposit. Lightning Futures has many other benefits! The minimum order size for Lightning Futures is 0.001 BTC. With Lightning Futures, there are various ways to place orders. By combining an array of order terms, you can place orders with a higher level of freedom than before. Both stop-loss and take-profit orders can be easily placed depending on your combination of order terms, allowing users unable to keep an eye on the Bitcoin market during the day to still enjoy trading. In addition to its REST API, bitFlyer also offers a realtime API feed. 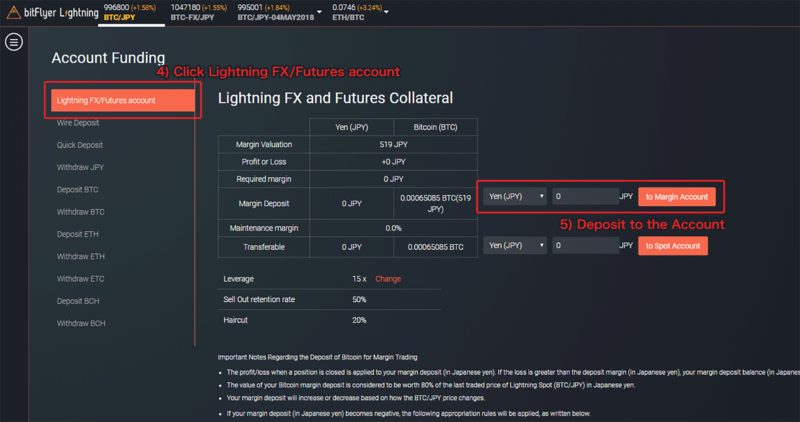 You can now deposit Bitcoin as collateral on Lightning Futures in addition to Japanese yen. 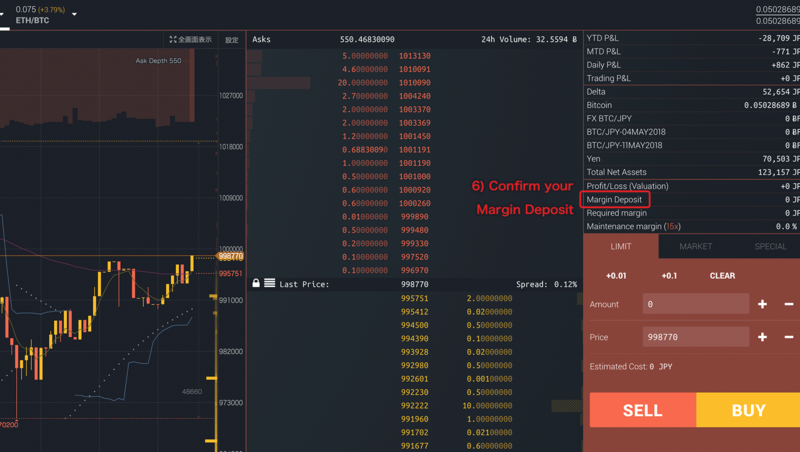 Before being able to trade on Lightning Futures, it is necessary to make a margin deposit. Lightning Futures regularly checks the status of margin deposits. If the retention rate of your deposit drops below a fixed level (maintenance margin), it will trigger a "margin call" or "sell out". For rules on margin calls and sell out, please refer to Lightning Futures trading rules. Example: The user wants to place an order or execution for 2 BTC using 10X leverage (margin deposit is 10%). Assume a rate of 1 million JPY / BTC. 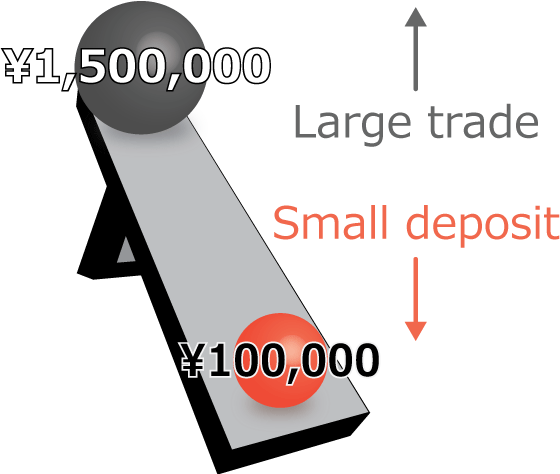 The required margin deposit is 200,000 JPY. Click the menu icon in the upper-left corner. Click "Lightning FX/Futures account." Input the amount you wish to deposit and then click "to Margin Account." Confirm that the deposit has been reflected to your margin. 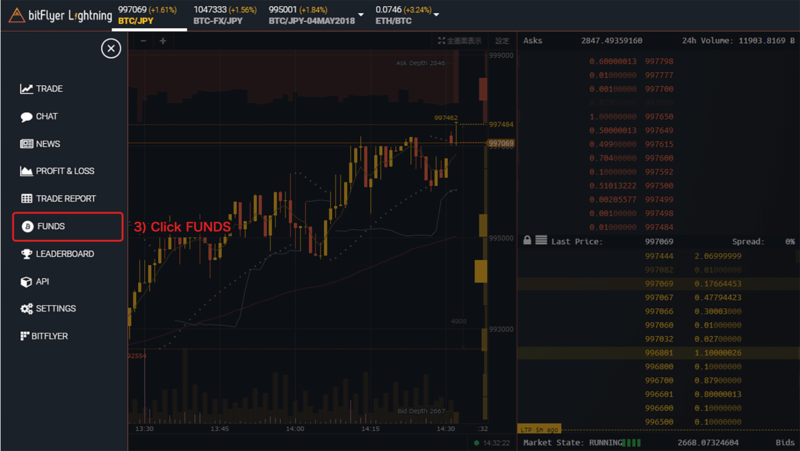 Before trading, please carefully read Notes on Lightning Futures and Risk. For further explanations regarding trades and trading rules, please refer to our Lightning Futures User Guide and Lightning Futures Trading Rules.